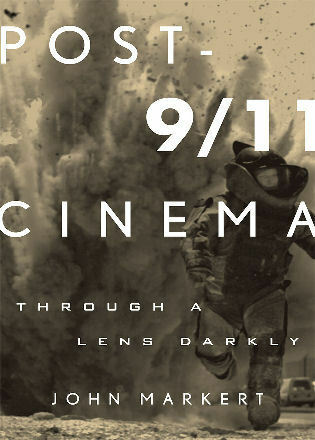 Should we expect films about 9/11 to be more enlightening than books, journalism or the internet? Little in John Markert’s comprehensive account suggests 9/11 cinema adds any deeper understanding of the religious terrorism practised by followers of the Children of Abraham. More than 200 works from the cinema, DVD, free-to-air and pay television are cited, some of them relatively unknown to those of us outside the USA. This alone makes Markert’s book a valuable reference work. His three broad categories are Saddam and Osama Bin Laden, the World Trade Centre and the war on the ground. He sketches out reflection/refraction theory asking if film and television mirrors or creates social values. He raises the spectres of Hegel, Marx and the dialectical process and traces three distinct periods – 2001 to 2004 when the USA grieved over the attacks and took action against the enemy (thesis); 2004 and 2005 when the political issues were questioned (antithesis); and 2006 to 2010 when public opinion turned against the wars in Iraq and Afghanistan (synthesis). His criteria for the “war on the ground” category exclude Syriana (2005) probably because it fails to reference either the Iraq or Afghan wars. Included are television series such as Generation Kill (2008), but not the rewritten or new episodes of West Wing (1999-2006) or The Sopranos (1999-2007), two programs running at the time of the World Trade Centre attacks. Presumably, their exclusion is for the same reason. Markert points at the failure to find weapons of mass destruction and the twin failures in intelligence and technology that left Bin Laden alive for a decade, as reasons for the erosion of public support. He wonders if “films preceded the change in public attitudes” (317). Not much is made of the failure to win hearts-and-minds in Afghanistan and Iraq. Regime change – “Mission Accomplished” – seems accepted as sufficient reason to wage the two wars. He uses the liberal and conservative divide in the USA to discuss changes in public perception – sometimes a little too simplistically. Describing footage of an amputee Iraq veteran: “In the scene we see him reach down and pick up the jigsaw piece, he does it with some difficulty. Liberals viewing this movie would be sure to see the problem he was having, which belie his statement that he is functioning well; on the other hand, conservatives would be struck by his dexterity and admire him for how well he is managing” (78). The content of these 200 films and television programs provides Markert with little intellectual sustenance for discussion. The overwhelming emotions and issues are grief, retribution, threat, war, hatred, heroism, spy agencies, suicide bombers, religious fanaticism, racism and “the war on terror” (the latter once referred to by Gore Vidal as “the war against an abstract noun”). The films seem predominantly caught in a 9/11 malaise, describing events, but coming up short with explanations for the traumatic symbolism of the falling towers or the clash of religions and cultures. Markert obliquely raises the issue of media convergence. The POST-9/11 CINEMA of his title (and it is in capital letters) obviously includes films shown in cinemas, but also television programs delivered to television screens by free-to-air, cable and DVD and from sources including the History Channel, Discovery Channel, Military Channel, Learning Channel and National Geographic. Availability of material on DVD from “movie rental outlets” apparently qualifies as cinema as their “movie-availability” makes them “DVD releases geared to a movie audience” (xxxii). Perhaps this convoluted and rubbery definition is all about the book’s title, but it does seem unnecessary, cumbersome and questionable. It might be argued that convergence means there is no real difference, other than scale and quality, between cinemas and television as it is all digital. The boundaries, however, do need some definitional diligence. An HBO/BBC four-hour mini-series The House of Saddam (2008) is described as “the only fictional movie of Saddam Hussein” and in the next sentence as a “feature film” (13). A four-hour television mini-series is neither a fictional movie nor a feature film. It’s a four-hour television mini-series and unlikely to be rebadged as a film anytime soon. Just as burning a television program onto a DVD does not make it a film. Intellectual insights aside, television did a remarkable, some might say triumphant, job with 9/11. It’s a pity to see the medium forcefully redefined this way.